Ahh sleep, an activity that is such a luxury. Sinking under a pile of blankets with a book in hand and then later dazing off with an eye mask on=heavenly ♥. Recently though I've found it harder to doze off so I headed to the beauty blogs to see if there was any offerings around to aid sleep and stumbled upon these two gems. 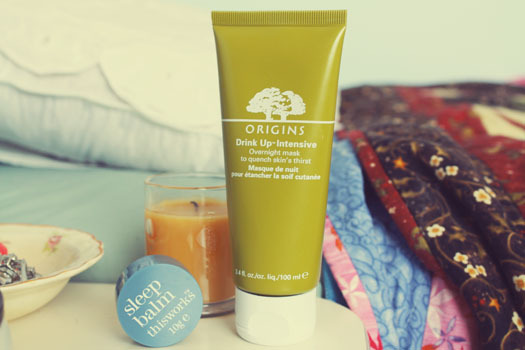 ♥ Origins Drink Up Intensive Overnight mask This doesn't technically improve my sleep but it is relaxing and definitely something I look forward to at bedtime so it deserves a mention. Even though my skin is on the combination/oily side it still has a few dry patches, particularly down the centre of my face and on my cheeks. This overnight mask is designed to moisturise the skin and with ingredients like Hyaluronic Acid and Apricot Kernel Oil the skin is left refreshed and replenished the next morning. I apply this mask twice a week, usually 30 minutes before I go to bed so that it has time to sink into the skin. Using this mask at bedtime is so pampering. It smells fruity but not overpowering and it dries clear once blended into the skin. Unlike other cream face masks I've tried this isn't an overly heavy cream formula which I like. I love this mask. My skin is always looking refreshed and revitalised the morning after applying this and dry patches appear to be reduced. ♥ This Works Sleep Balm Lavender is one of the key ingredients in a lot of products designed to aid sleep. I apply this balm to my pulse points and find it incredibly relaxing and soothing. Lavender is such a calming scent and this balm definitely seems effective at aiding sleep and relaxation. I purchased some more of This Works' Sleep range in a Beauty Bay sale which I think is more intensive if you really need a good night's sleep, but more about that in Part 2 of this post! Mask and balm applied, lights dimmed and iPod playlist at the ready, you're all set for a pampering night in. *If you're in New Zealand or Australia you can pick both of these products up at Mecca Cosmetica. really interested in the this walks sleep range so can't wait for your post on that. the origins mask sounds lovely too! I'd highly recommend the This Works range! It's on offer over on Feel Unique if you're interested in picking up any bits now. The Origins mask is also fab, it's such an affordable price too for the amount you get. It is really such a soothing scent & if you're not the biggest fan of lavender it isn't too overpowering which is a huge bonus.